So, I finally attended a Christian wedding wearing a dress. And I crossed it off my bucket list, but it’s also made me want to attend more of Christian weddings. 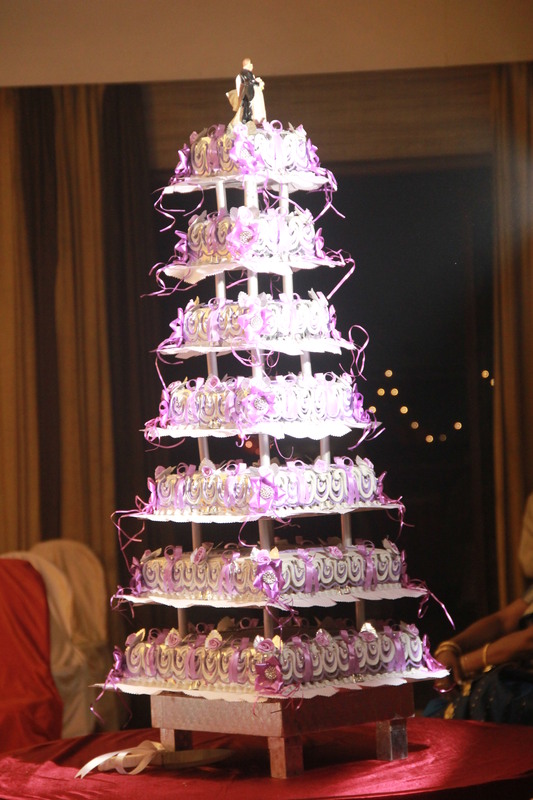 The colour theme of this wedding was white and lavender. 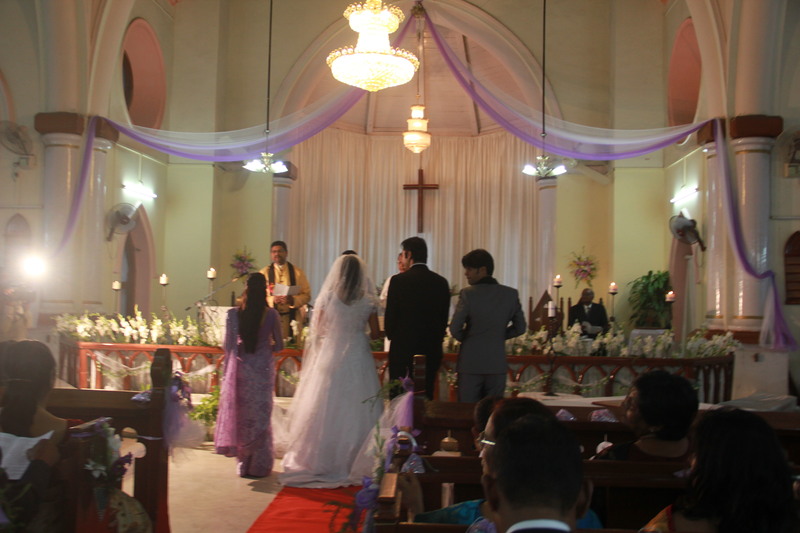 As you can see in the above picture, the decoration in the church was simple yet beautiful. My sister and I performed the duties of the Groom’s sisters by attaching favors (the purple rose brooches in photo below) to the guest’s clothes, while also trying to click photographs of all the important moments. I didn’t upload some good pics here because I don’t like uploading photos online where people’s faces can be seen clearly. But, I loved the pic below because of the happiness that can be seen in the bride’s face. The wedding was short and sweet. The bride and groom exchanged rings, said their vows, and the groom put a mangalsutra round the girl’s neck. All of us sang prayers asking God to bless the couple. The pastors blessed the couple. The couple lit the Unity candle, and signed in the Marriage registry in front of two witnesses. And that was it! No lengthy pooja/ceremony by a priest where you don’t even know what you are doing and why you are doing it. Then, the pastor gave a short discourse to all of us on marriage, and he also gave some advice to the newly married. I don’t remember each and every word he said, but I am writing down whatever I advice I remember. Include God in your happiness and celebrations, not just in your sadness and problems. I also love the below photograph of the bridesmaid catching the bouquet the bride threw. The cake was beautiful (and tasty!) too. A big plus in this wedding was that it was all over by 9 – 9:30 pm. 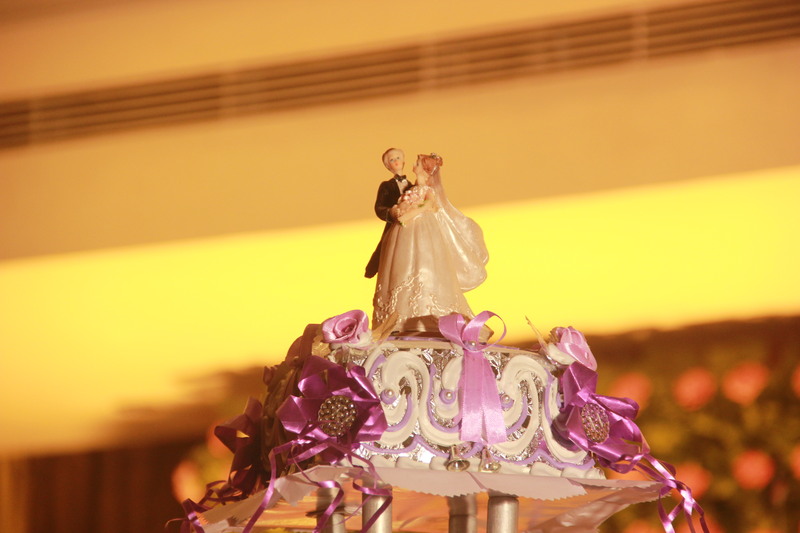 The main wedding was from 4:30 pm to around 6 pm, and the dinner/reception was from 7 to around 9 pm. Everything was punctual. All the guests had arrived on time, and there were no noisy firecrackers. It was a beautiful experience. I love weddings!! So full of love and happiness. The glow in the bride and the groom’s face is heart-warming. And I wish the bride and groom all the best for their future, with a life full of love and happiness. This entry was posted in Bucket List, Weddings and tagged bride, bride and groom, bridegroom, Christian wedding, favors, happiness, life, love, wedding cake, wedding decor, weddings. Bookmark the permalink.